Here is another fish dish with a creamy and delicious sauce that marks my 200th post! 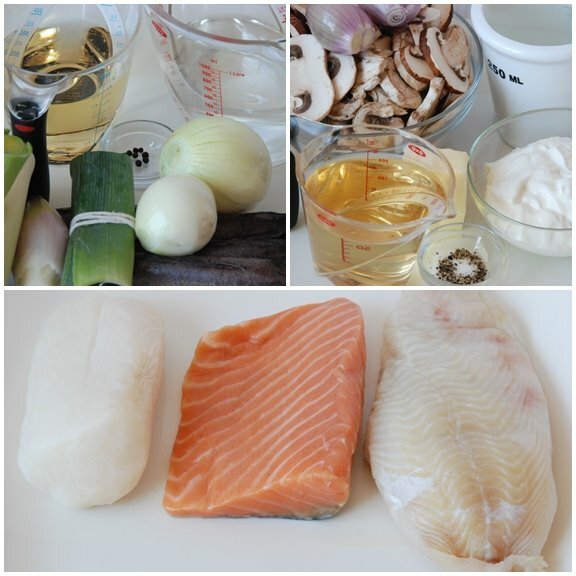 The first step for this dish is to make some fish stock. We covered this in Class 10. The recipe for the stock makes 4 cups and I only needed 1 cup for the fish, so I put the remainder in the freezer for another time. The recipe calls for a whole sea bass, however, I had some leftover pieces from earlier fish classes so I decided to use them up instead. To cook the fish, I placed it in a roasting pan with 3 tablespoons of butter and sprinkled the fish with salt, pepper and the shallots. I poured the wine and water in and brought everything to a boil while waiting for the oven to heat up. Then, when it was boiling I covered it with buttered parchment and put it in the oven to finish cooking for about 20-30 minutes. I love mushrooms. These are just cooked in butter and seasoned with salt and pepper while the fish cooks. When the fish was done, I removed it from the roasting pan and set it aside while finishing the sauce. The sauce couldn't be simpler. I just strained the liquid from the roasting pan and reduced it by half. Then I added the sour cream (since I forgot to make crème fraîche the night before). I stirred this mixture until it thickened. To make crème fraîche, combine 1 cup (250 mL) of heavy 35-percent cream with 2 tablespoons (25 mL) sour cream in a glass container. Cover and stand at room temperature 24 hours, or until very thick. Stir well, cover and refrigerate. Keeps up to 7 days. You can watch a video, in French, of a chef making this dish. I enjoyed watching his technique. You can find the recipe for Bar à la Normande (Sea Bass with Mushrooms and Cream) in the book Le Cordon Bleu at Home. To see how the rest of the Whisk Wednesdays group fared with their recipe, click here (or check out the sidebar) and then click on each blogger! I love fish with a sauce. And this one with mushrooms is delicious. The whole house smelled of fish, but it was worth it. The nuttiness from the mushrooms, the delicate fish and the tangy sauce were perfect. What an awesome picture of the sea bass. I'm drooling. wish i could come over for dinner... you definitely won't have any leftovers! Hey, happy blog milestone!! Hoping for many more years of W:aFB :) That looks soooo good. I'm glad the sauce didn't split because of the substitution of sour cream! What a lovely dinner!! I love seafood!! Great photos as well! Your photos are always so gorgeous! I loved this sauce too...just delicious! I love that green bowl! Happy 200, my friend! Delicious looking dinner - I really like that you show the different fish together too. Shari - it looks lovely! Congrats on your 200th post - I've enjoyed so many. I love to cook fish, and this sounds really good. Which fish did you like best? Hi! how far along in your LCB cook book now? I'm kinda blogging on LCB cooking too. (it's a kinda complicated story..) I visited a cuisine and pastry class in LCB in Paris, and that was amazing! Absolutely delicious! 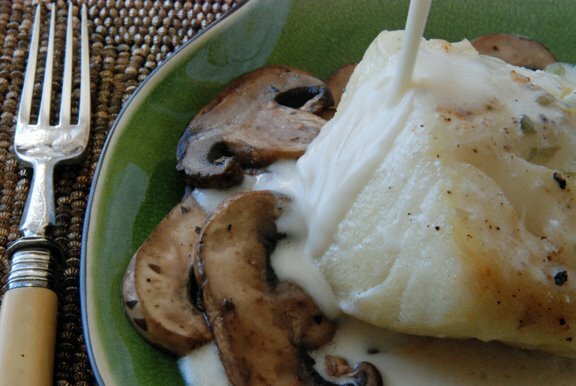 Fish, mushrooms and cream are such nice partners. YUM - that fish looks so fantastic! Shari that looks delicious. I can't wait to start cooking your group. That really looks delicious Shari! Awesome pics! I have some sad, lonely fish stock in the freezer and had no idea what to do with it. No more! Happy 200th post! And a wonderful post it is! Oh yours is so beautiful! And what a capture of the sauce pouring. That is great! I think I'd have to have a bit of each type of fish. Yum! This looks amazing - I'm trying to cook fish more often, so I'm always looking for new recipes. Shari! This is gorgeous! I can't wait to fix it! I doubt I can get sea bass, but I'm thinking rockfish will sub nicely. I have a big, thick fillet that will stand up to oven roasting. Perfectly lovely dear! You and me need to meet sometime, I will bring cupcakes and you can just go on doing what you do! Droooling right here! It must have been delicious !! Congratulazioni ! Congrats on your 200th post!!! and what a yummy post it is. I just love fish. The sea bass looks amazing! Sounds like an elaborate dish with high payoff. The end result looks amazing. I had to sub cod, but my husband loved it. The cream sauce came together nicely. sea bass is my fave fish. wish i could find time to participate in whisk wednesdays, it's such a wonderful idea. happy blog milestone! really love your blog.